In many people's opinion, here's the record album that set the band's present style and established its reputation. Jim Snyder, Lew Green and John Cooper started in the band in those years. The new CD is dedicated to Jim's memory. The other two are still playing in the band five decades later! 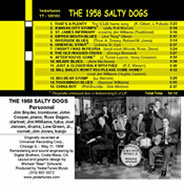 This recording was professionally made at Universal Recording Corp. in Chicago on May 11, 1958. All members were Purdue students at the time but were veterans of years of off-campus band jobs in Chicago and throughout the Midwest, on TV and on other college campuses. The new CD was professionally remixed from the original stereo studio tapes. 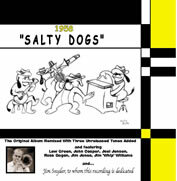 Three selections, too long for the vinyl record, have been reintroduced, bringing an hour of pure Salty Dogs joy to listeners. A sixteen-page booklet covers the band's history from 1947 to 1958, has nine photos of the band of those years, describes the exciting recording session and documents the tunelist with extensive discographical notes. The new CD is domestically available directly from YesterTunes Music, its producer, for $15 postpaid by domestic check, international money order or PayPal to "Jim Jones" - 2747 Vista Mesa Dr. - Rancho Palos Verdes CA 90275 USA. It is also available from Worlds Records and Delmark Records on their websites. Overseas inquiries are invited.